If you are asking, “Should I get dentures?”, Carolina Dental Arts is here to help you make an informed decision, as well as provide your dentures in North Carolina. Our restorative dentistry serves patients from Raleigh to Goldsboro by creating dentures of all kinds that replace missing teeth and surrounding tissue, as well as closely resemble your natural teeth. Common reasons for dentures can include loss of teeth in an arch, enhancing your smile and facial tissues, and improving chewing, speech and digestion. In order to meet the specific needs of our patients, Carolina Dental Arts offers two types of dentures in NC: complete and partial. Complete dentures are worn when all teeth are missing and can be either conventional or immediate. Conventional dentures are made after the teeth have been removed and the gum tissue has healed. This usually takes four to six weeks, and the patient goes without teeth during this time. Immediate dentures are made in advance and are immediately placed after the teeth are removed, preventing the patient from having to go without teeth during the healing process. Once the tissues shrink and heal, adjustments are made to the dentures. Our NC partial dentures are used when some natural teeth remain. They fill in the spaces created by missing teeth, while also preventing other teeth from shifting. Our process for getting dentures in NC requires several appointments over a few weeks, During these appointments, molds and measurements of your mouth are taken and used to create your custom dentures, as you’ll try on your dentures several times to ensure proper shape, fit and color. Our restorative dentists will place the completed denture during the last appointment. When getting used to your new dentures, you can expect to experience increased saliva flow, soreness and possible difficulty chewing or speaking, but these issues will pass as your muscles and tissues adjust. 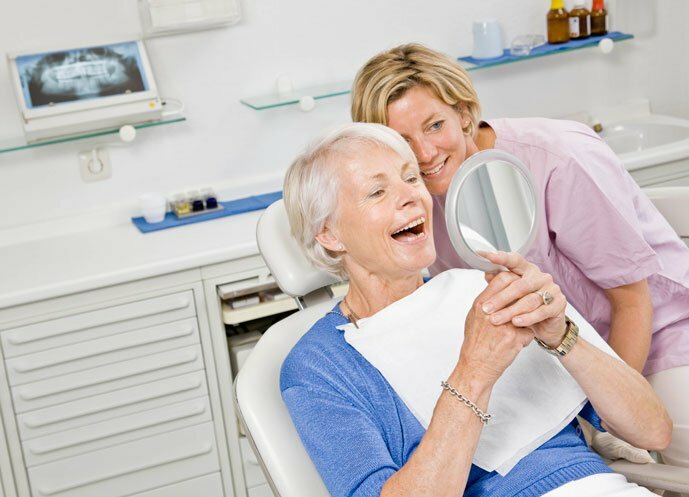 Our team will instruct you on how to care for your new dentures, as proper cleaning, good oral hygiene and regular dental visits will help your dentures last for years. Dentures are very durable, but over time they will need repairs, adjustments or remaking due to normal wear. Carolina Dental Arts is happy to provide these denture repairs for our patients. If you would like to learn more about getting dentures in NC, contact our teamtoday — we would be glad to assist you in improving your dental health in any way we can.